I’m back from Hawaii….. sort of. Of course it didn’t help that we arrived back just in time for the snow and ice. As I was shivering back home, I found my mind drifting to the lovely island farmer’s markets filled with papaya, avocados, and fragrant flowers. Or a meal at one of the wonderful restaurants that highlights the multi-cultural fusion food that has become an island signature. Hawaii has an interesting culinary history that has brought about this melting pot of cuisines in the islands. When the first wave of islanders arrived somewhere around 300AD, there was hardly any edible plants or animals on the island. These brave voyagers are believed to have brought around 30 edible plants as well as pigs, poultry and dogs to eat. They soon found out that the taro they had brought was perfectly suited for the wet and humid conditions of the islands. This became the Hawaiian’s stable along with plenty of fish, coconuts and bananas. Their diet had some wonderful new introductions when globe roaming discoverers found the islands. Captain Cook introduced goats, English pigs and seeds for onions, melons and pumpkins to the islanders. Soon after that, pineapple was first cultivated there, along with the discovery of the wonderful attributes of sugar cane. 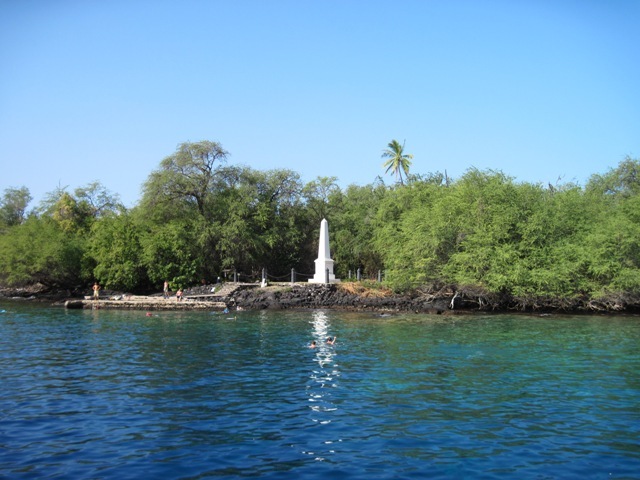 The Captain Cook monument in Hawaii, where he got...cooked. Pineapple and sugar cane became the king crop for Hawaii in very short order. By the 19th century, most of the island’s lands were planted with these two dominate crops, which were owned and ran by American settlers. They were planting up a storm and using natives to do all the back breaking work. Spicy dishes and meat turnovers were contributed by the fiery Puerto Ricans immigrants. The Filipinos were close on their heels, bringing adobo style and garlicy rich dishes to the strata of Hawaiian fare. Last but not least, the Vietnamese laborers were brought over right before the sugar and pineapple industries went belly up, adding lemongrass, coconut milk and ginger to the fusion. Mix all those cultures together with the local produce and you get Hawaiian cuisine. There is nothing like it. Some of the popular dishes are Kalua pork, Poké (raw tuna mixed with sesame oil, soy sauce, green onions and seaweed), The Loco Moco (breakfast dish consisting of rice, hamburger patties, fried eggs and brown gravy). Or how about the Spam Musubi (spam layered with sticky rice and wrapped with nori) and Haupia pudding (coconut pudding cut into squares that look like soap). 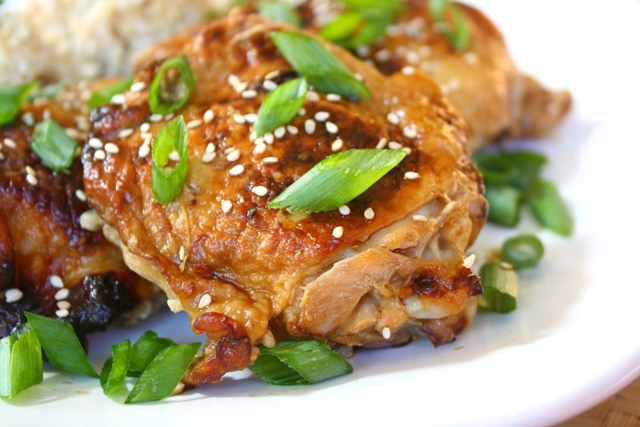 One of my personal favorite dishes of Hawaii is the Shoyu chicken, a “plate lunch” staple. “Plate lunches” are a quintessential part of the cuisine of Hawaii. The idea likely came from the Japanese immigrants who would take cold rice and a left over meat to the fields for lunch. Plate lunches usually consist of a scoop or two of rice, macaroni salad and an entrée like Kalua pork or Shoyu chicken. First off and very importantly put on some Hawaiian music. Whisk together the soy sauce through the hot sauce in a large bowl. (If you want to skin the chicken thighs here, go ahead. Traditionally Shoyu Chicken is cooked with the skin on.) Add the thighs to the marinade and stick in the fridge for about a half hour, up to an hour. I love the suggestion of cooking with Hawaiian music on! 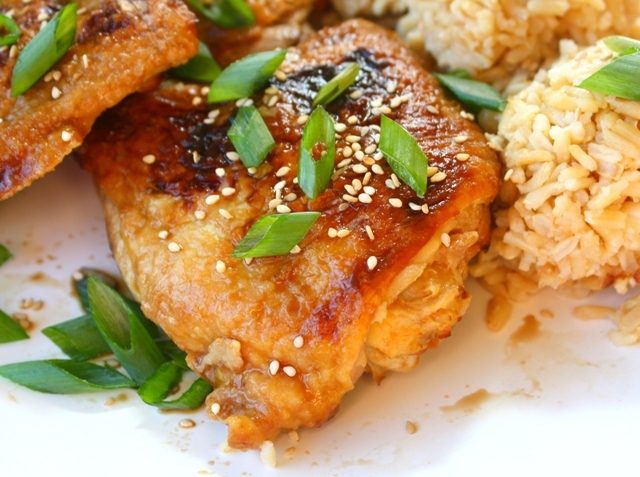 I have to do that sometime, especially if I make this shoyu chicken dish! Looks ono! Hi, This is a great post. I love learning about history and culture. Here it was good to know about Hawaiian cuisine. Thank you. “mahalo” ..I will be making your recipe soon! I like your write up and comments, much appreciated:) I made hulk-huli chicken last night for my guests but your recipe looks awesome! This sounds delicious! I will have to give it a try. We used to live in HI and my mom makes Shoyu Chicken differently. Is THIS the ‘traditional’ island style? No this is not traditional. I like to bake my chicken but most Shoyu Chicken is cooked in a pot on the stove. Thanks for coming by! I´m studying english and my teacher told us to prepare an essay about my favorite cuisine. I’m from Peru, but I’d like to learn about other cultures. And I liked your cuisine.